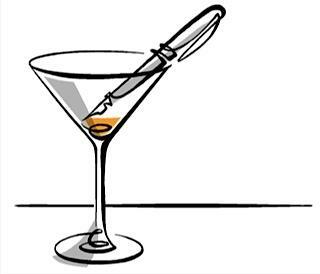 Guardian's article Why Do writers drink alcohol is a true treasury of authors' writing and drinking habits. Really interesting and opens my eyes on writers who I considered as nearly saint because of their high status in literature. A writer's audience is and remains invisible to him, but if he is any good he is acutely and continuously aware of it, and never more so while it waits for him to come on, to begin p.1. Alcohol not only makes you less self-critical, it reduces fear. - says Amis while searching answer to "Why they drink?" question and focusing on American writes who had written and drunk a lot and make their spot in history of modern American literature. In respect to their writings not drinking (or maybe both). The list of authors is long and famous (Poe, Hemingway, Faulkner, F Scott Fitzgerald, Charles Bukowski...). The article continues to list reasons of drinking and consequences of heavy drinking on writing inspiration. Some writers became drinking buddies, some got addicted and ended up on rehab, others made drinking protagonist in their works. For some glass of whiskey was like a grand opening and brainstorming, for others it was a disaster as they got drunk too easily and fast. Writing and drinking duet has no reading nor nationality preferences, it applies to all literary genres, from poetry, though literary fiction ending on playwrites and novels and writer's nationalities from American through British and Russian. Fiction may look like the right form for alcoholics, as their dependency teaches them to be good at lying. But holding a novel in your head becomes more difficult when you're holding a glass in your hand as well. "A short story can be written on a bottle," Fitzgerald told his editor Max Perkins, "but for a novel you need the mental speed that enables you to keep the whole pattern in your head and ruthlessly sacrifice the sideshows." Well, some drunk works were good, some not. Article's author sums it with a paraphrase of saying: Drank like a fish, wrote like an angel," would make a pleasing epitaph. "Drank like a fish, wrote like a fish" is more likely. But are readers better? The New Yorker lists bar-readers as a big group of people reading in pubs with a glass in one hand and book in the other. These two stories of drinking writers and drinking readers join together as many pubs rely on literary history of a given place and openly make use of stories, anecdotes, tables and chairs that some writers were sitting by and glasses they were drinking from. But there's also other connection, nearly metaphysical. We want to be like writers we read. And so the drinking must connect to the writing, either as a spark of creativity or as a release from that creativity. Or perhaps the sentimental association of drinking and writerly genius is just an attempt at forming a connection with the great authors of the past. Most of us can’t write like our heroes, but nearly every one of us can try to drink like them. 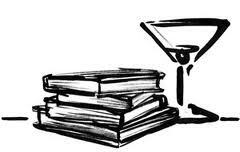 Reading while drinking is easier that writing and drinking. Bukowski also said, “It’s hard to write prose when you’re drinking, because prose is too much work." Some books even encourage you to choose right setting, dim light, candles, cigarette's smoke and a full glass to feel the book atmosphere even better and totally immerse in it. However the author continues with a book description that can change your reading bar preferences - the book that will make you never want to drink again.